When I was in grade school, one of my favorite hobbies was reading Reader’s Digest. The long articles didn’t really appeal to me, but Word Power, Life’s Like That, Humor in Uniform and Quotable Quotes were like candy treats which I devoured voraciously. Looking back, I think that my young mind was not ready to deal with the more serious articles, and so I focused on the shorter sections. Those reading days, I’m sure, contributed much to my love for writing, which led me to pursue a career in feature writing. For any writer, having a vast amount of words at one’s disposal is power. And for the feature writer, quotes are so important – a necessary ingredient to a sumptuous feast of words, sentences and paragraphs. A feature writer is quick to note a quotable quote, and having at least a couple of them can transform an article from one that is interesting, to one that is both interesting and authoritative. Like many writers, I collect quotations. I have a small notebook where I copy quotable quotes. I highlight sentences worth remembering in my kindle, and copy/paste those read from blog posts and online articles on One Note. Aside from being a feature writer, I also journal profusely. One day many years ago I decided to read through some old journals. I was surprised (and delighted) to discover that I had written a few quotable quotes, which I copied on another notebook where I began to write my own quotable quotes. A quotation from a text or speech: “a quote from Darwin”. A short musical passage or visual image taken from one piece of music or work of art and used in another. A short, pithy expression that generally contains advice or wisdom. A collection of such expressions identified with a particular person, esp. a political or religious leader. That settled, I would now like to share some sayings in this post. Perhaps some readers will find them to be quotable quotes and my sayings will become quotations. That would be great! When we pray, we call on the best of all that we are, so that we may be able to be better than what we think we are. Prayer gives us permission to dream and to express our desires to fulfill those dreams. Support is very important for writers, primarily because writing is by and large a lone-some endeavor. A writer spends many solitary hours researching, reading, writing, revising and then revising some more. Observing is a very soulful activity that gives us the opportunity to watch and witness what is going on around us – but it goes beyond that. As we observe, we also touch base with our soul, with what is within. And it is this that makes the difference in the way we write. Observing is a fine, steady thread that connects the outer world with our inner world. We watch and observe, and at the same time we feel, and draw from within insights that help us create a story unto its own, one with the indelible mark of our soul. 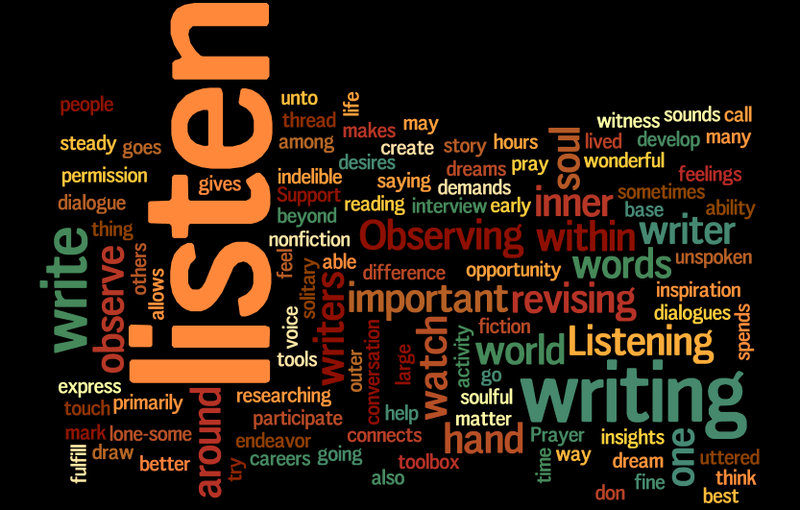 Listening is one of the more important tools in a writer’s toolbox, and it is an ability that both fiction and nonfiction writers should try to develop early in their writing careers. We listen to what others are saying. We listen to the dialogue between and among people. We listen to the sounds around us as we interview or participate in a conversation. We listen to the “unspoken” words that sometimes matter more than words that are uttered. We listen to the voice of inspiration. We listen to our own inner dialogues. We listen to our own feelings. As writers, we were taught to collect quotations and use them to pepper our writing. But as writers, we also write many quotable sentences. Ain’t that grand? So go on, read through your blog posts, journal pages, stories, articles and poems. I bet you it won’t take you long to find a treasure of your very own quotable sayings. And when you do find them, why not share them here? What a good idea to write the quotes I find, and like, in a journal or notebook. Usually, I have to go searching through the web for a quote, when I could find a better one if I had a collection going. I think I’ll start one with yours. I especially like your last saying, because it also works for speaking. Rosanna, I totally know that feeling of “I wrote that?” Sometimes we do amazing things that we don’t even notice at the time. I like your idea of keeping a collection of quotable quotes. I can’t count the number of times that I remembered reading or hearing a quote that would have perfectly illustrated my point, but I couldn’t remember the exact wording or who said it. Google’s great, but you’ve got to give it something to work with. Sometimes I just didn’t remember enough to get any good results. Wonderful post! I get what you’re saying as, when I re-read things I wrote a couple of years ago, there are many times I’ll think “wow! I wrote that?” Nice to know it’s a common thread among those who journal or scribble or otherwise put their words down somewhere to be re-read at a later time.